BaGuaZhang or PakuaChang is the second of the "three sisters" of Neijia, or Internal Martial Arts (Kung Fu) practice. 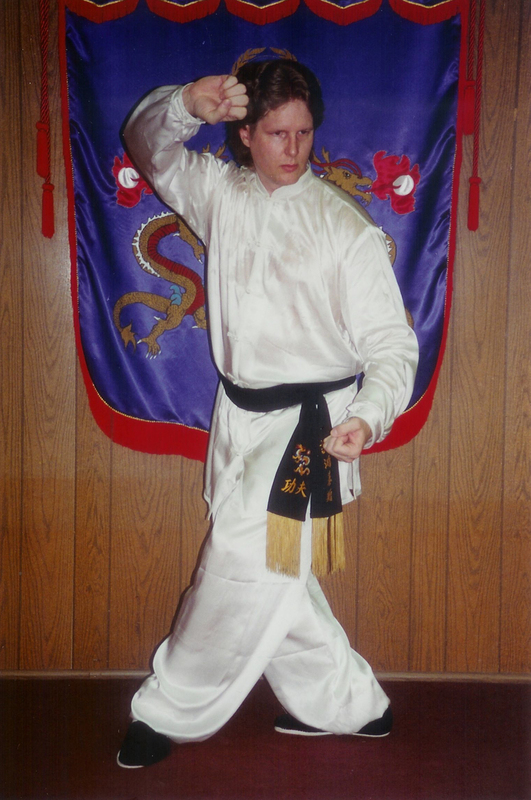 The Neijia School of thought is comprised of Bagua, Xingyi and Taiji as primary disciplines. There are many different styles of Baguazhang being practiced today. It has been long thought that the diversification stems from early teachers of this art imparting different training structures to their pupils depending on the prior martial background the student carried into the study of Bagua. Regardless of the reasons, the yield is a multitude of different styles in practice and widely recognized today. Each style of Baguazhang has a different flavor, but the appearance of the form, regardless of family, will have certain characteristics that remain a constant. Each method will also contain certain unique techiques and training methods that may set it apart from the other methods, or families as they are sometimes called. For example: The Lung Hsin (Dragon Heart) style is a powerful integration of smooth angular transition coupled with the characteristic spriral winding and unwinding of Bagua, yielding an appearance that is not entirely unlike stringing together a series of Xingyi turning sequences in terms of visual effect. In contrast, the You Lung Hsing (Swimming Dragon Form) has the appearance of a languid, continuous expanding and contracting spiral that is truly inspiring and visually stunning at high speeds. Compare any of the other methods to these two and you will get yet again the combination of same, yet not same, which is perhaps fitting for an art that derives its principles from the I Ching or Book Of Change. Bagua's tactical principles of constant motion, bait and switch, hit and run, and blending with the ever changing canvas that is combat remain a constant throughout all the various styles. As do the mechanical methods of closing and opening the body with spiral-like power. There are several recognized spelling and/or renderings of this arts name. The most common now perhaps being BaGuaZhang from the newer PinYin system of Chinese phonetics, or PaKuaChang from the Wade/Giles. Other common spellings include the abbreviated Bagua, Pakua or Pa-Kua. Also, on occasion an apostrophe is added, as in Pa Kua Ch'ang to further emphasize the pronunciation. Let me share with you a few of our perspectives on the key aspects of the Chinese Internal Art forms of kung fu... Follow the other links within the Bagua section... Body, Characteristics, Goals, History, Mind, Spirit or Internal Vs. External, to learn more about this internal martial art form. Here is a video sampling of BaGua (pakua) movement and application.